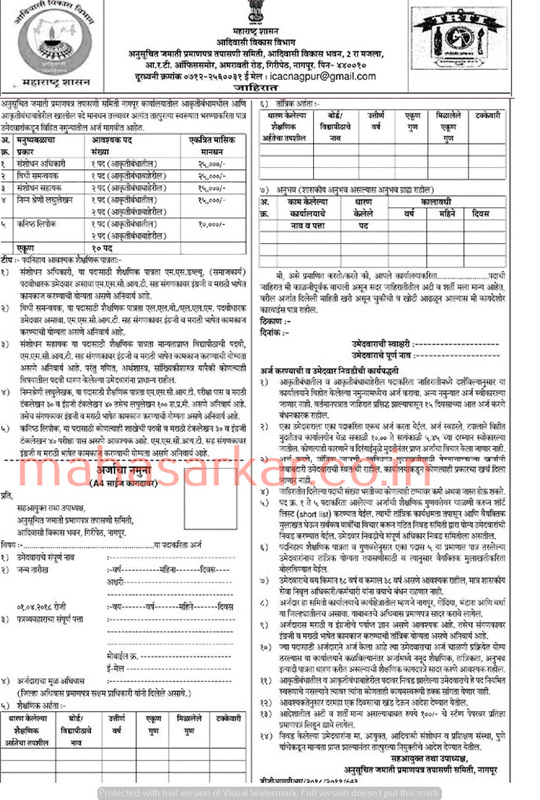 MAHA Adiwasi Vikas Bhavan (Scheduled Tribes Certificate Verification Committee), Nagpur Published Job Notification for 10 Research Officer – Law Coordinator & More Posts. Candidates who wish to apply must look at MAHA Adiwasi Vikas Bhavan Research Officer – Law Coordinator & More Recruitment 2018. Eligible candidates can apply Offline before 22-05-2018. Education Qualification: MSW Degree MSCIT/LLB/LLM/Degre/Typing Speed-30 WPM and In English 40 WPM and More. For Post wise Education Details follow the detailed advertisement. Interested & Eligible candidates can send their application along with all the necessary documents and testimonials to Co-Commissioner and Deputy Chairman, Scheduled Caste Certificate Checking Committee, Tribal Development Bhawan, Giripeth, Nagpur. Starting Date, Last Date to Apply Offline at Scheduled Tribes Certificate Verification Committee which candidates should be remembers as follows. Start Date to Apply Offline: 07-05-2018. Last Date to Apply Offline: 22-05-2018.